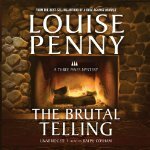 Louise Penny writes such lush cozy mysteries – they have death but no gore. Her Detective Armand Gamache is smart enough to be polite and sensitive while putting the clues together and leading his team. Although Gamache lives in Quebec City, the nearby village of Three Pines is the setting for most of the books in this series. Three Pines is a small town with a number of artists living there. In this book, The Brutal Telling, the body of unknown man is found in the popular Oliver’s Bistro, owned by Oliver and Gabri, a young gay couple. When Gamache and company find the hidden home of the dead man it is full of precious antiques but who is he? Where is he from? And what about the strange little hand carved pieces with letters on them – different. I enjoyed listening to this book and recommend it if you like traditional mysteries with a cozy atmosphere. Cosham always does a good job.